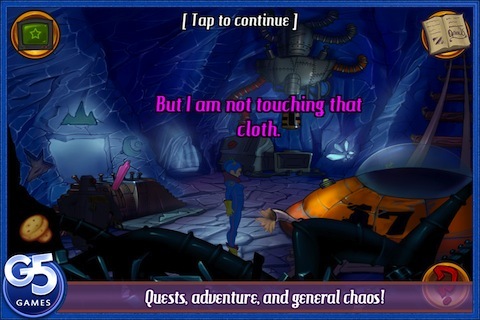 Kaptain Brawe: A Brave New World is immediately reminiscent of a popular old iPhone game called Monkey Island. It is graphically amazing and sometimes quite funny. Unlike Monkey Island, some of its puzzles leave the user bewildered and confused. Developed from a PC adventure of the same name, Kaptain Brawe: A Brave New World places the user in control of Kaptain Brawe. It is Kaptain Brawe’s mission to find two scientists that have been kidnapped by fairly stereotypical bad guys. The characters are entertaining and sometimes make the user laugh hysterically. The story moves along very nicely because of the great visual setup. There are over forty settings for Kaptain Brawe in the fully unlocked version. The free version limits the number of levels a user can play before being prompted to expand to the full version for a reasonable price. 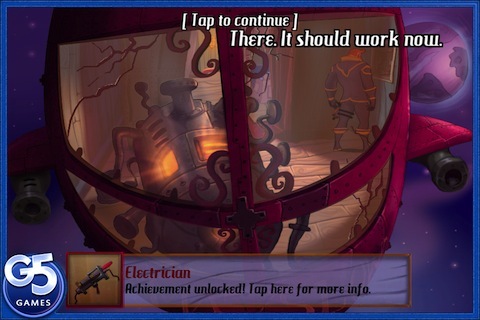 The flaw with Kaptain Brawe is that some of the puzzles seem arbitrary and purposefully annoying. Some of the puzzles are throwbacks for a console adventure fan, including one that is oddly similar to a puzzle that needed to be solved in the original NES title Star Trek. Most of the puzzles are a matter of finding the right items and asking characters the right questions. The problem comes in the fact that often the solution is very counter intuitive. Even after correctly solving some of the puzzles, the user is left wondering why that worked. For a challenge that is based entirely on puzzles, it is important that a user have an “aha!” moment instead of wondering why the developers seemed to just pick some random setup to solve the problems. For a frustrated user, there are options that help make the progression remain enjoyable. The tutorial is very helpful at explaining how to manipulate the action through the iPad, iPod touch, or as an iPhone app. The learning curve is very quick on an application of this nature. Kaptain Brawe also provides levels of difficulty, so if a user is finding the app to be a little too tough, it can easily be reduced all the way down to a casual difficulty level. In the easiest setting, a question mark icon appears that when tapped shows every item on the screen that a user can interact with. This difficulty level also provides hints for a user that does not want to simply have the entire application revealed with a tap. Kaptain Brawe is an app designed for a less casual iPhone app user. It is challenging and visual stimulating but the puzzles can be a little frustrating. The free version of Kaptain Brawe provides enough content to form a solid opinion of the game’s worth. AppSafari review of Kaptain Brawe: A Brawe New World was written by Darius Reimm on December 19th, 2011 and categorized under Adventure, App Store, Free, Fun, Games, Puzzler. Page viewed 3284 times, 1 so far today. Need help on using these apps? Please read the Help Page.